Traditional volatility trades used to involve buying and selling portfolios of call and put options, straddles or strangles, and then possibly delta-hedging these positions. But such volatility positions were not pure and this led to a search for volatility tools whose payoff function would depend on volatility risk only. In this part we are going to see two volatility instruments that were developed : Volatility and variance swaps. Variance is the second centered moment of a random variable. Volatility instruments require convexity adjustments, whereas variance instruments in general do not. When we talk about vega, for example , we refer to variance vega. This is the sensitivity of the option’s price with respect to sigma^2 not sigma. Volatility positions can be taken for the purpose of hedging a volatility exposure or speculating on the future behavior of volatility. 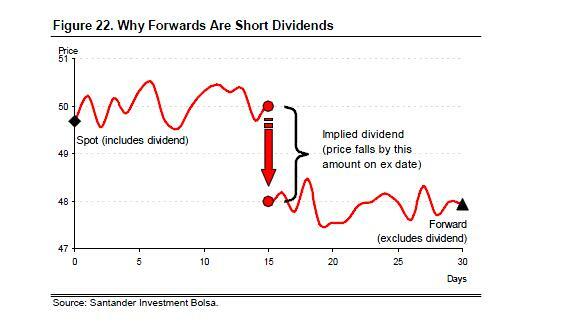 A forward is a contract that obliges the investor to buy (or sell if you have sold the forward) a security on a certain expiry date (but not before) at a certain strike price. 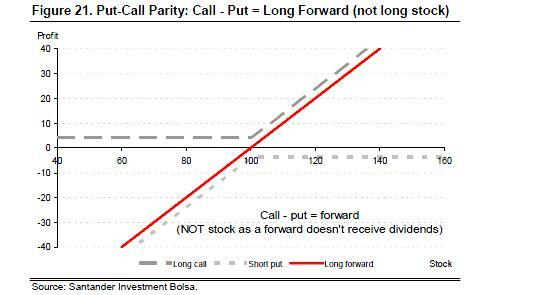 A portfolio of a long European call and a short European put of identical expiry and strike is the same as a forward of that expiry and strike, as shown in Figure 21. 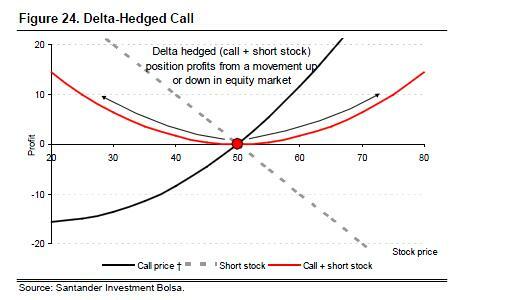 This means that if a call, a put or a straddle is delta hedged with a forward contract (not stock), the end profile is identical. We note put-call parity is only true for European options, as American options can be exercised before expiry (although in practice they seldom are). If an option is purchased at an implied volatility that is lower than the realised volatility over the life of the option, then the investor, in theory, earns a profit from buying cheap volatility. However, the effect of buying cheap volatility is dwarfed by the profit or loss from the direction of the equity market. For this reason, directional investors are usually more concerned with premium rather than implied volatility. Volatility investors will, however, hedge the equity exposure. This will result in a position whose profitability is solely determined by the volatility (not direction) of the underlying. As delta measures the equity sensitivity of an option, removing equity exposure is called delta hedging (as a portfolio with no equity exposure has delta = 0). We shall assume an investor has purchased a zero delta straddle (or strangle), but the argument will hold for long call or put positions as well. If equity markets fall (from position 1 to position 2 in the chart) the position will become profitable and the delta will decrease from zero to a negative value. 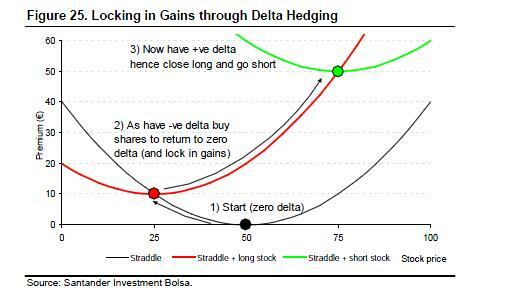 In order to lock in the profit, the investor must buy stock (or futures) for the portfolio to return to zero delta. Now that the portfolio is equity market neutral, it will profit from a movement up or down in the equity market. If equity markets then rise, the initial profit will be kept and a further profit earned (movement from position 2 to position 3). At position 3 the stock (or futures) position is sold and a short position initiated to return the position to zero delta. ATM option premium in percent is roughly 0.4 × volatility × square root of time. If one assumes zero interest rates and dividends, then the formula for the premium of an ATM call or put option simplifies to 0.4 × σ × √T. Therefore, a one-year ATM option on an underlying with 20% implied is worth c8% (= 0.4 × 20% × √1). OTM options can be calculated from this estimate using an estimated 50% delta. Historical annualised volatility roughly equal to 16 × percentage daily move. Historical volatility can be estimated by multiplying the typical return over a period by the square root of the number of periods in a year (eg, 52 weeks or 12 months in a year). Hence, if a security moves 1% a day, it has an annualised volatility of 16% (as 16 ≈ √252 and we assume there are 252 trading days). As returns are normally close to 1 (=100%) the log of returns is very similar to ‘return – 1’ (which is the percentage change of the price). Hence, to calculate the annualised volatility for a given percentage move, all that is needed is to annualise the percentage change in the price. This is done by multiplying the percentage move by the square root of the number of samples in a year (as volatility is the square root of variance). For example, market convention is to assume there are approximately 252 trading days a year. If a stock moves 1% a day, then its volatility is 1% × √252, which is approximately 1% × 16 = 16% volatility. Similarly, if a stock moves 2% a day it has 32% volatility. If an index is 3000pts and has a 20% implied then the price of a 3M ATM option is approximately 240pts (3000×8% as calculated above). A 3200 call is therefore approximately 240 – 50% (3200-3000) = 140pts assuming a 50% delta. Similarly, a 3200 put is approximately 340pts. If the effect of theta is ignored (as it is a cost that does not depend on the size of the stock price movement), the profit of a delta hedged option position is equal to a scaling factor (gamma/2) multiplied by the square of the return. This means that the profit from a 2% move in a stock price is four times (22=4) the profit from a 1% move in stock price. This can also be seen from Figure 27 below, as the additional profit from the move from 1% to 2% is three times the profit from 0% to 1% (for a total profit four times the profit for a 1% move). 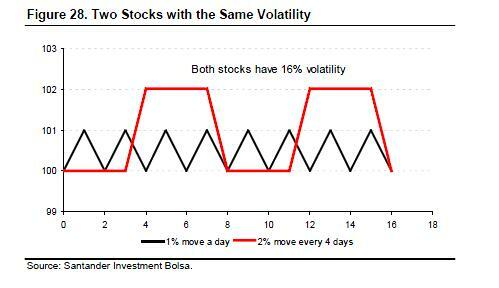 Let’s assume there are two stocks: one of them moves 1% a day and the other 2% every four days (see Figure 28 below). Both stocks have the same 16% volatility and delta hedging them earns the same profit (as four times as much profit is earned on the days the stock moves 2% as when it moves 1%). Partly due to its use in Black-Scholes, historically, volatility has been used as the measure of deviation for financial assets. However, the correct measure of deviation is variance (or volatility squared). Volatility should be considered to be a derivative of variance. The realisation that variance should be used instead of volatility led volatility indices, such as the VIX, to move away from ATM volatility (VXO index) towards a variance-based calculation.  Variance takes into account implied volatility at all stock prices. Variance takes into account the implied volatility of all strikes with the same expiry (while ATM implied will change with spot, even if volatility surface does not change).  Deviations need to be squared to avoid cancelling. Mathematically, if deviations were simply summed then positive and negative deviations would cancel. This is why the sum of squared deviations is taken (variance) to prevent the deviations from cancelling. Taking the square root of this sum (volatility) should be considered a derivative of this pure measure of deviation (variance). 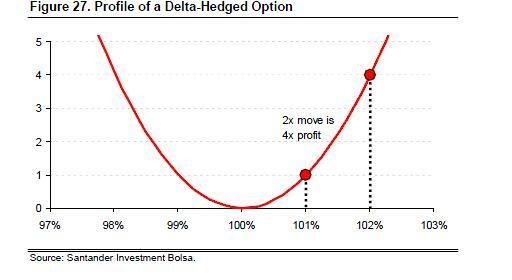  Profit from a delta-hedged option depends on the square of the return. Due to the convexity of an option, if the volatility is doubled, the profits from delta hedging are multiplied by a factor of four. For this reason, variance (which looks at squared returns) is a better measure of deviation than volatility. 4 For more details, see the section Volatility, Variance and Gamma Swaps. of options in the absence of a variance swap market) is bought, then its traded level is applicable no matter what the level of spot. The fact a variance swap (or log contract) payout depends only on the realised variance and is not path dependent makes it the ideal measure for deviation. If a seesaw has two weights on it and the weights are the same distance either side from the pivot, the weights are balanced as the centre of the mass is in line with the pivot (see graph on left hand side below). If the weights are further away from the pivot the centre of the mass (hence the average/expected distance of the weights) is still in line with the pivot (see graph on right hand side below). If the deviation of the two weights from the pivot is summed together, in both cases they would be zero (as one weight’s deviation from the pivot is the negative of the other). In order to avoid the deviation cancelling this way, the square of the deviation (or variance) is taken, as the square of a number is always positive. This can also be seen from Figure 27 Profile of a Delta-Hedged Option in the previous section (page 45), as the additional profit from the move from 1% to 2% is three times the profit from 0% to 1% (for a total profit four times the profit for a 1% move).